Your instrument deserves the softness and strength of the Oasis® OH-7 Microfiber Suede Polishing Cloth. It cares for your instrument like no other. These ultra-thin, ultra-soft fibers measure only 1/20th the diameter of silk and are the absolute best for cleaning fine musical instruments. The microfiber suede of our polishing cloth is a 75% polyester and 25% polyamide blend. It attracts dirt like a magnet and eliminates the need for oily polishes and the residues they leave behind. This 12 x 12 inch soft polishing cloth is extremely durable and can be washed repeatedly. 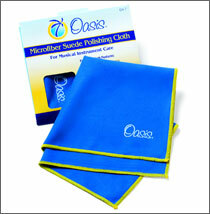 Purchase an Oasis® OH-7 Microfiber Suede Polishing Cloth today for only $6.95.